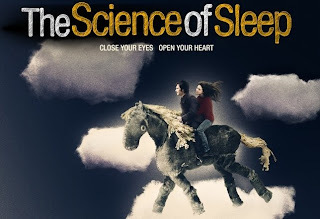 The Science of Sleep stars Gael García Bernal as Stéphane Miroux and Charlotte Gainsbourg and Stéphanie. Interesting tidbit: The time allotted to the three languages spoken in this movie (English, Spanish and French) is split almost evenly. Though we are sleeping, our brains are convinced that our dreams are real. Though our senses are dormant, as far as we can tell what we are feeling is genuine. If the way we function resembles God's way of functioning at all (as we are created in His image) then this might hint at God's creative processes. It is reasonable to say that the world as we know it is the reality that God imagined for us. If this is the case, mightn't we also be the product of one of His dreams? If this was the case, does God have many different dreams, which bring into existence a multitude of different realities that we could never comprehend? Stéphane stressed how much he labored during his dreams. This is true to some extent... although we create effortlessly in our dreams, our dreams tend to be purposeful, driven by what is important to us. So also God created the world with what appears to be little effort (He spoke it into existence), yet at the same time He created everything with purposeful order that He knew to be good. The Science of Sleep also brings us the issue of order vs. chaos, or mathmatical predictability vs. randomness. While Stéphane was trying to create the appearance of water using different shades of cellophane, Stéphanie warned him that his waves were looking too organized. She said, "Randomness is very difficult to achieve... organization always merges back if you don't pay attention." The organization the two of them were trying to avoid was the predictable, manmade kind of organization that we are so fond of. When something becomes unpredictable or exceeds our ability to discern a pattern, we call this "randomness." Earlier in the movie, Stéphane describes the phenomenon where two people walking down the street get stuck trying to get around each other: "Parallel Synchronized Randomness. An interesting brain rarity... Two people walk in opposite directions at the same time and then they make the same decision at the same time. Then they correct it, and then they correct it, and then they correct it, and then they correct it, and then they correct it. Basically, in a mathematical world these two little guys will stay looped until the end of time... The brain is the most complex thing in the universe and it's right behind the nose." This says a lot for the complexity of God's creation... His work is unpredictable as well as incalculable. Faith is required to see purpose in what seems to be the natural randomness of life. Stéphane supposedly uses Chaos Theory to fix Stéphanie's mechanical horse, giving it the ability to "gallop." I wonder, is the Chaos Theory the best explanation we can come up with to explain our existence? Apart from God, yes. Then again, when God enters the equation, a lot of things that seemed chaotic before start make a lot more sense.
" The earth was without form and void, and darkness was over the face of the deep. And the Spirit of God was hovering over the face of the waters. Then God said, 'Let us make man in our image, after our likeness..." So God created man in his own image, in the image of God he created him; male and female he created them. " When Stéphane dreams he creates new worlds for himself. These new worlds are a mixture of things that are important to him, what concerns him and what happened to him recently. The construction of Stéphane's dreams, which he envisions as a make-shift movie set, hints at a healthy perspective on material, or the consumption of resources. He uses cardboard and paint and paper to create his new worlds, but this is a worthwhile expenditure. This reminds me that there is greater purpose for material things than just for sustaining life-function. This can be difficult to remember as we become increasingly fixated on striking a balance between human subsistence and the environment's well-being. What a brilliant take on spirituality in movies. I'm not religious myself, but this blog is a very interesting concept and (for me) a fresher way of looking at movies. Although I love Michael Gondry's work in music videos and film (e.g. "Eternal Sunshine of the Spotless Mind"); I just could not get motivated to watch this film. I will have to give it another go though.